Magnificent one of a kind large finely hand-carved and hand polished rock crystal eagle with spread wings and black obsidian eyes and beak on beautiful a Amethyst Geode base, all resting on a brown gemstone base. The eagle's feet are gold plated bronze. The quality of the rock crystal and carving is superb. The wings are carved to be securely removable from the body of the eagle, and the entire eagle is removable from the geode for shipping purposes. 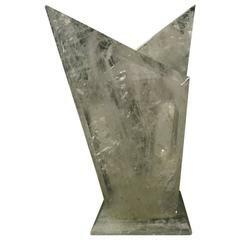 Unique modern hand-carved and hand polished rock crystal vase. Rock crystal eagle mounted on a black marble base. Beak and talons are gilded bronze. A remarkable eagle sculpture made of lapiz and rock crystal. Beak is tiger's eye. Claws are gilded bronze. All mounted on a black marble base. 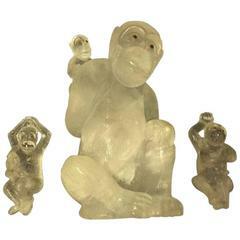 A very beautiful sculpture in rock crystal hand carved directly from the block. The eagle represent a very strong symbol of power and freedom. Scholar rock Smoke crystal Hand carved Limited edition. Crystal inclusions vary. Each item is unique, please see images for references of different variations.